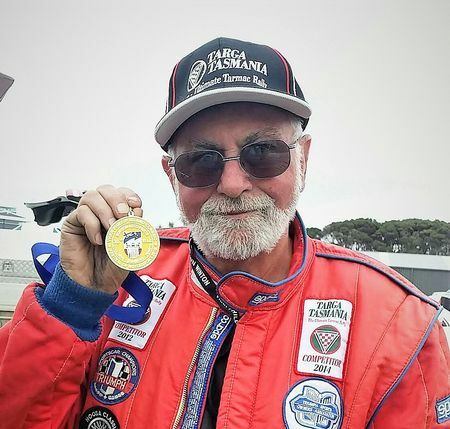 Fresh from his class win at the Philip Island Historic, Neil's navigator and team manager for Targa Tasmania took 5 mins out for a quick Q & A about the event. Where is "The Philip Island Historic" held? Philip Island is on the Mornington Peninsula south east of Melbourne, the track hosts motorcycle and 4 wheel GP's and is without doubt the most spectacular race track in Australia. Located beside the sea, both drivers and spectators are treated to a magnificent spectacle. Tell us a bit about the event? The Philip Island Historic is an event now celebrating its 30th Anniversary. Held over 3 days catering for classics over numerous classes, attracting 500+ entries from across the globe. Knowing my track driving abilities, I entered the regularity class where cars are released individually and we race ourselves against the clock is a much safer option over the door handle to door handle events. Each day there are 3 runs with Run 1 of Day 1 qualifying, for regularity this allows drivers to nominate their lap time which is the measure we are required to achieve over all laps. For the race classes, the cars are gridded according to their lap times. To keep the event on track, there were no nominated number of laps, rather the organisers applied a track time so should there be any delays, this would not impact on subsequent class events. As said with over 500 entries, many driving classics from all points of the globe, it is quite interesting in the pit paddock to observe the various languages and team spirit which is universal. Tell us a bit about your car, the preparation made prior and your experience of the event? I drove my track prepared 1967 TR4a which has some minor performance enhancements developing around 130bhp, which is plenty as the car handles great. Before embarking, the car was checked from top to bottom, everything tight that should be tight, wheel bearings and universal joints well lubricated. Engine and gearbox oils changed. With the spares packed just in case and the car loaded onto the trailer we headed off on the 4 day drive across the continent from Perth Western Australia to the far eastern side, a total journey of nearly 4000km's. We hired a holiday house on the Island arriving a few days early for recovery after the long trip. Each morning the usual checks were carried out, not a drop of oil or coolant needed, If we need any further confirmation of Triumph reliability!!! Never put a spanner on the car over the whole event! and with the extra sticky track tyres fitted it was quite formidable passing most in my class. Ultimately the TR took first outright. Many thanks to my support team who without their emotional and physical support this event would not have been so enjoyable. My wife (the very lovely Di) did a magnificent job as catering manager. After the event we drove home again on 'Cloud 9' after winning our class. Before leaving Philip Island, we booked the house for 2020. Can't wait!! !